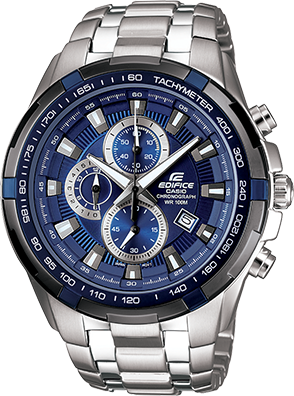 This new addition to the EDIFICE metal lineup feature chronograph timekeeping along with advanced functions for linking with your smartphone. The EQB900DB delivers the same accurate timekeeping, multi-functionality, and simple operation as EDIFICE smartphone link series models of the past, along with two additional new features. The first new feature is a high-brightness LED light source between 6 and 7 o’clock, which brightly illuminates the face for easy reading both night and day. The second feature is a compact, lightweight configuration. The case width and thickness are the smallest of all the EDIFICE smartphone link models. The cases of these models are 2.3 mm smaller in diameter, 2.1 mm thinner, and approximately 25% lighter than the EQB-500D, which was the first EDIFICE smartphone link model. Despite the smaller size, the visual impact of the hour markers and dials have been enhanced to create bold designs. An Accurate Time System automatically connects to the internet via a smartphone four times a day to acquire timekeeping information and keep watch time settings accurate. Summertime settings are also updated automatically. An app running on a smartphone eliminates the need for complex watch button operations to configure World Time Settings, and increases the number of selectable cities to 300. Another of the many functions that are worthy of special mention is solar power. A large-capacity Tough Solar power system enables long-term use without the need to connect a cable or replace batteries.